The FlyKly Smart Wheel: Too Good to Be True? Continue reading The FlyKly Smart Wheel: Too Good to Be True? Posted on November 12, 2013 November 14, 2016 Author larryCategories Design, DIY, Electric Bikes1 Comment on The FlyKly Smart Wheel: Too Good to Be True? This summer was one of the hottest summers on record. Several people have asked me how I managed to survive. My response: I didn’t notice. I didn’t notice it was unusually hot in spite of spending much of my time outdoors training for a marathon and doing my errands by bike. I didn’t notice precisely because, counter-intuitively, these activities caused me to sweat and my sweat kept me cool. How could this be? For some reason our culture has an aversion to sweat. Our media keeps up a constant barrage of messages about how we must avoid sweating and that if we do somehow err by sweating we must hide it at all costs. Of course there is a place for personal hygiene and we must take care not to impose our old smelly sweat on our fellow citizens. But we sweat for a reason–to keep ourselves cool–and furthermore we are very good at sweating. A recent Scientific American article described how one of the most basic ways our human ancestors gained an advantage over other predators is by our ability to sweat. No other animal sweats as well as we do. This ability enabled our ancestors to track large game until it fell over from heat exhaustion, a technique known as persistence hunting. Many other animals can outrun us for short distances. But we are the masters of long distance running on this planet. A human can run a marathon faster than a horse, because the horse will keel over from heat exhaustion before it gets to the finish line. And so how do we make use of this great ability of ours in modern times? Do we augment our ability to keep cool in some way as we have done with so many of our other abilities? No, instead we vilify anyone who sweats in public. It is outrageous to me that we subvert this great advantage we have for dealing with hot weather, then complain about the weather, then build big machines to make ourselves cooler, and finally watch complacently as these machines contribute to the very climate warming we were complaining about. I propose that instead of looking at sweat as the enemy we learn to harness it for its intended purpose: to cool us down. It is much more energy efficient to cool ourselves individually (perhaps with motion or fans) than to use big energy-intensive machines to cool down entire rooms and buildings. And it is the height of hypocrisy and inefficiency that our cars are designed to be basically greenhouses on wheels. As a result they must carry massive air conditioning equipment to keep their occupants cool. 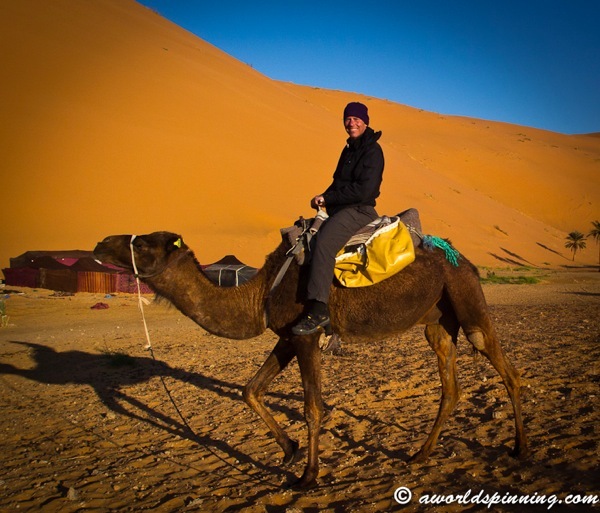 Instead, cars could make use of our natural abilities to cool ourselves by sweating and combine that with the built-in breeze of their forward motion. Air conditioning will be one of the first superfluous accessories jettisoned by our lightweight/narrow/slow cars of the future. What will replace it? Think about the vents cars have now and how they could be improved. It seems that no one in our bone-headed auto industry has taken the time to reconsider the simple air vent. What are some ways it can better put a breeze where it’s needed? For that matter, where is the breeze needed? Sweating effectively requires having airflow over one’s back. Current cars place your back squarely in a cushy seat with no possibility of air flow. What if for starters cars had mesh seats? What if we had the vents blow directly from the seat onto our backs? Or better yet, what if we had ventilated clothing that clipped directly into the car’s cooling system? And we won’t need any kind of sophisticated automatic temperature control. Just provide a steady air flow and your body will sweat or not as necessary to keep itself comfortable. Use an electric bike. Moving on an electric bike is especially nice since it can provide a breeze without so much exertion. And if you are on foot, my experience is that someone can actually stay cooler by running slowly and efficiently rather than walking. The faster airflow from running combined with sweating kept me cooler than the slower airflow (but less exertion) of walking. However, running efficiently takes practice. It probably also helps to be thin. Don’t wear a backpack while biking. Backpacks block air flow. Get a cargo bike so you can carry your stuff off your body. Go shirtless. Don’t be a prude dude. Let the sweat out. But carry a jacket for when you stop. Carry twice as much water as you think you’ll need. You’ll need it. Only stay in the sun if you are moving. The airflow will keep you from overheating. Cool down in front of a fan after biking. You will notice a surge in body temperature after you stop biking, with a corresponding surge in sweat output. Don’t waste that sweat! Cool down with whatever breeze and fan and shade you can find. Only after the sweat has completely evaporated should you take a shower if circumstances require. So this summer by following these simple tips I actually looked forward to biking and running as an opportunity to go outside and cool down. I did not let the weather reports dictate whether or not I could go outside. Don’t believe me? Try befriending your sweat! 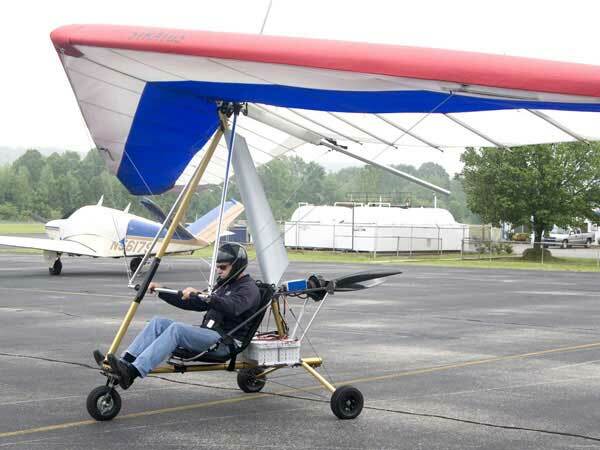 The ElectraFlyer ultralight. Note the guy wires. Its electric motor weighs twice as much as my Stokemonkey motor (26 vs. 13 pounds) but it has 18 times the horsepower. The battery weighs 6.5 times my 36v 10ah Prismatic LiFePo4 (78 pounds vs. 12 pounds) but produces about 10 times the power. An Xtracycle with this monster motor and battery would add 104 pounds to the bike but would increase the range to 250 miles. Add that wing, throw in a propeller and my Xtracycle could fly! Thomas Morse Scout showing guy wires. Incidentally this plane was manufactured in Ithaca the small town where I live. I’ve been trying to wrap my head around guy wires. No that doesn’t mean wires made by guys. It means a tensioned cable used to brace parts of a structure or vehicle. 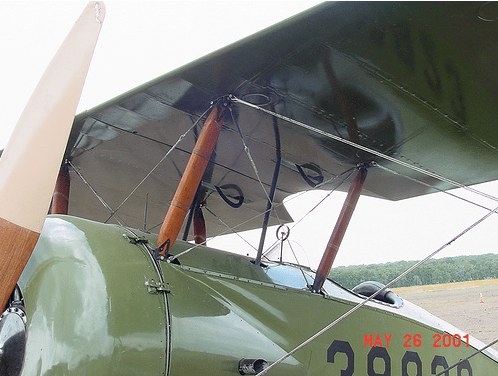 For example have you ever noticed the cables forming Xs between an old biplanes’ wings? Those cables prevented the two wings from moving relative to each other. They also made it possible for a biplane to be lightweight. As biplanes’ motors became more powerful weight has not been so much of a factor and you don’t see as many or any cables on a modern biplane. However you do see cables on ultralight aircraft as shown. More and more you see cables used in architecture. I argue that we need to use more cables—and parts under tension in general—in the design of our cars. Guy wires to stabilize my solar canopy. 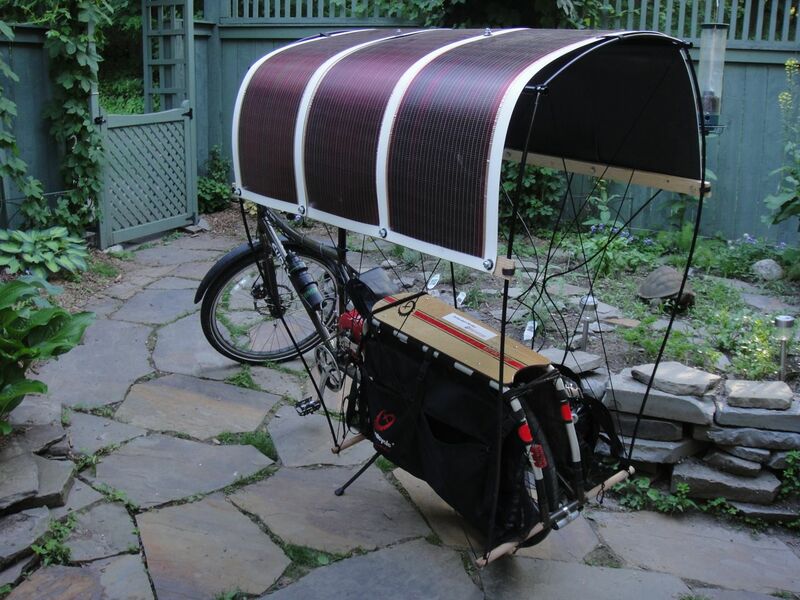 I recently needed to add guy wires to my Bike Wagon canopy design because when I put my solar panels on top of the canopy, the added weight made the canopy wobbly. A few cable Xs solved the problem. It got me thinking about how the design of ultralight airplanes and bicycles and lightweight vehicles in general requires using tensegrity. Say what? “Tensegrity” is a word that American architect and inventor Buckminster Fuller made up by combining the word “tension” with the word “integrity” to describe a new building technique. The basic idea is that you can make way cool lightweight structures by combining something with structural integrity (such as a hunting bow) with something that is under tension (such as the bow string).Tensegrity structures can have the unnerving property that the beams of the structure don’t actually touch each other (see the Tensegritoy below). Our bodies themselves use tensegrity: our bones provide the structural integrity and our ligaments and muscles provide the tension. 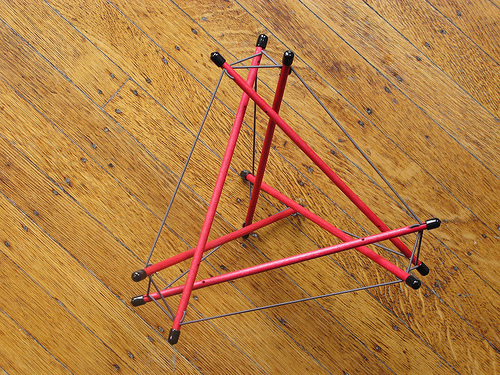 A wonderful way to get hands-on experience with tensegrity is to order a Tensegritoy kit. The bicycle wheel is another good example of tensegrity. Back in the day wheels were constructed using wooden spokes. The spokes needed to be thick and heavy. The bicycle wheel, in contrast, uses tensegrity. The rim provides the structural integrity and the spokes provide the tension. This design creates a very strong lightweight wheel. A car wheel (excepting the occasional MG) does not use tensegrity; it is solid metal. A car’s large powerful internal combustion engine overwhelms any need for weight savings. Incidentally there are commercially successful bike frames that use tensegrity. The Millenium Dome in London is constructed out of steel towers and tensioned fabric. Tensegrity is a revelation in architecture. The first large buildings relied on gravity and the compression strength of stone to hold themselves up. Then with the invention of the steel I-beam, buildings could use the structural integrity of the I-beams to hold themselves up. More and more architects are experimenting with tension components such as steel cables and fabric. Some of these structures are what the layman would call a tent. 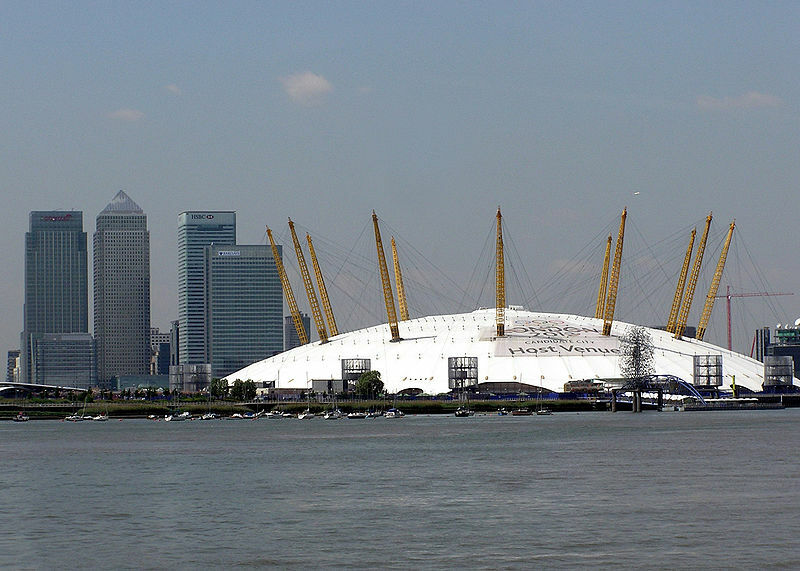 However, we’re talking tents that are very large permanent structures such as the 1,200 ft. wide (365 m) Millennium Dome. Two related ideas are tensile structures (elements carrying only tension and no compression or bending) and tensairity structures (pneumatic structures that use inflated airbeams and attached stiffeners or cables). Buckminster Fuller's Dymaxion Car. It was about 6 feet tall, seated the driver and 10 passengers, weighed less than 1000 lbs., went 120 miles/hr on a 90 horsepower engine, and got between 30-50 miles to the gallon of gas! I believe road vehicles need to undergo a similar transition—from compression to tension components in their construction—so that they can become light enough to be powered by humans and by sunlight. Contemporary cars have structural integrity mainly by virtue of the strength of steel. I envision lightweight slow small vehicles that use aluminum poles, cables, and fabric to give them shape. Is this possible? It can’t hurt to dream big. In 1930 Buckminster Fuller’s own car invention, the Dymaxion Car, weighed less than 1000 pounds and could carry 10 passengers. 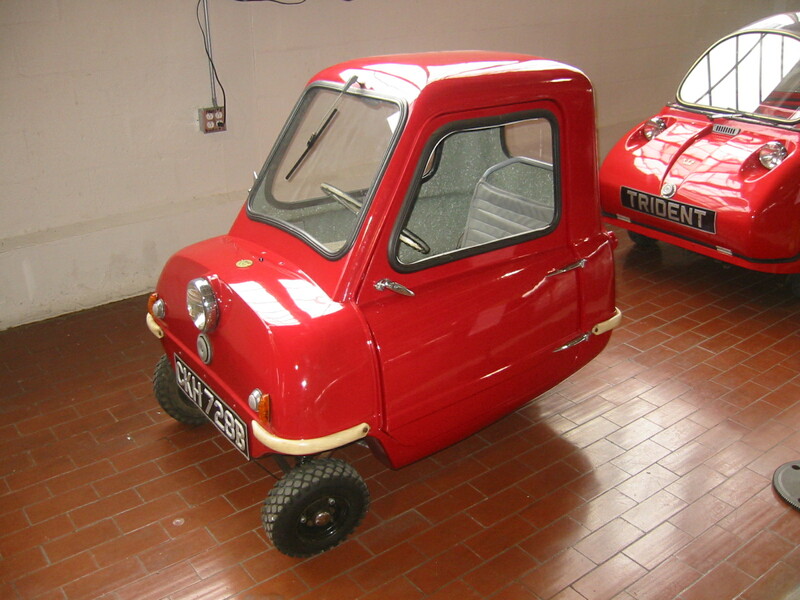 The 1965 Peel P50 microcar. I’ve been sharing with people my ambition to turn my Xtracycle “cargo bike” into a microcar. This has led me to ask what exactly is a microcar? And what would it take to give an Xtracycle the functionality of a microcar? It turns out microcars are not a new idea—they’ve been around since the dawn of the twentieth century. They are basically very small cars, usually between 150 and 1,000 pounds, powered by a 49cc to 500cc motorcycle-like engine or an electric motor, and often they are three-wheeled. They tend to be very cute and have become the objects of desire for many collectors and clubs. Various forces have caused microcars to wax and wane in popularity. For example they flourished after both World War I and World War II, perhaps as a way for people to economize. They also tend to flourish in places where their small size gives them tax, insurance, or drivers’ licensing advantages. Because of these economic forces, microcars are more popular in Europe and Japan than the U.S. For example in Austria and France they have a reputation for being the vehicle of last resort for people who lost their driver’s license for drunk driving. In some European countries, they became popular because taxes and insurance used to depend on engine displacement or power. Modern Japanese microcars, called Kei cars, are designed to exploit local tax and insurance regulations, and in more rural areas are exempted from the requirement to certify that adequate parking is available for the vehicle. I believe (and others believe) the time is right for the microcar to rise again, and I believe the bicycling community will have a hand in that transformation. There is a vacuum forming in our transportation system for a slow narrow vehicle that weighs between 100 and 1000 pounds. The car manufacturers don’t seem interested in coming down from their planet-wrenching upper end of the weight scale. It’s left up to the bike manufacturers to come up from the low end, to produce an intermediate-sized vehicle. My electric-assist “stoked” Xtracycle already has some of the specs of the smallest microcar, the Peel P50. The P50 weighed 130 pounds; my stoked Xtracycle with a canopy enclosure and other amenities will weigh about the same. The P50 has a 4.2 horsepower (3,131 watts) motor; my electric motor can put out 750 watts, which, along with some human power thrown in, might sometimes reach half that power on a good day. We’ve got the beginnings of a microcar here. Furthermore, bicyclists can give birth to a new kind of vehicle because we are unhindered by the constraints that the auto industry has. For example the side impact laws—necessary for vehicles that go highway speeds—make it technically impossible for the auto manufacturers to make a car that weighs less than 1000 pounds. Also the car industry is constrained by the limitations of mass production. Before the car industry can roll a microcar through it massive factories it must first ensure that there is a very large market for it. Bike shops, in contrast, only have to convince a few hundred people to buy one of their hand-crafted microcars which they can build from off-the-shelf parts. This situation is similar to the pre-mass production era when many small shops produced only a few hundred of their often eccentric cyclecars, the original microcars. Cyclecars were small inexpensive cars manufactured mainly between 1910 and the late 1920s. They were called cyclecars because they often incorporated motorcycle parts. They were very inexpensive for cars; the Buckboard cyclecar cost as low as $200 ($2,800 in 2010 dollars). The auto industry must also overcome peoples’ expectations that all cars must be able to drive at highway speeds and highway distances. There is a movement among environmentally-minded manufacturers to create a new class of cars called Neighborhood Electric Vehicles, which weigh less than 3,000 pounds, typically have a range of 30 miles and have a top speed of 25 mph. But given what I know about American culture I don’t think this movement will succeed. People balk at the idea of a car that only goes 25mph, but a bike that goes that speed is cool. So what is stopping a bike shop from making a microcar? Two things: the legal definition of a bicycle, and technical constraints. For an electric-assist bicycle to be legally considered a bicycle (rather than a motorcycle or car) it’s motor must be less than 750 watts, it must have functional pedals, it’s maximum speed must be less than 20mph, and it must have two or three wheels. This last constraint is important: if you give a vehicle four wheels it seems the full weight of automotive regulations falls upon it. There is some hope that these legal constraints will rise. For example I read recently that the motor limit in New York has been raised to 1,000 watts. So is it technically possible to build a vehicle within those legal constraints that achieves the same functionality as a microcar? I believe it is. My Xtracycle cargo bike is almost there. Why hasn’t anyone done it before? Maybe because electric motor and battery technology wasn’t so well developed until now. Maybe the consumer base wasn’t there. Maybe the gas price, tax, insurance, and licensing forces weren’t in alignment. I sense that they are coming into alignment now. What would it take to turn a cargo bike into a microcar? What can a microcar do that a cargo bike can’t do? One big difference is speed. We can make a cargo bike faster by adding an electric motor, but we still have the 20mph legal limit. For me this is not a problem. Carrying capacity is more important than speed for me, and electric motors have an advantage over internal-combustion engines in this regard. For a given horsepower, electric vehicles such as my bike tend to be slow but with great carrying capacity, whereas internal-combustion-powered vehicles tend to be faster but unable to carry as great a load. For example my bike has a 400-pound carrying capacity and a maximum speed of 20mph, whereas the P50 described above probably can’t carry much more than one 200-pound person but it can carry them at 38mph. I would much prefer a microcar that can carry a lot rather than a microcar that is fast. The next biggest functionality a microcar has that a cargo bike doesn’t have is a canopy. I’ve outlined my design criteria for an Xtracycle canopy in a previous post. Bicycles have a long history of incorporating canopies; bikes with a canopy are called velomobiles. However, again, velomobiles seem to be built for speed rather than cargo capacity. Another design direction that incorporates a canopy with a bike is the bicycle car, which typically means a pedal-powered vehicle with four wheels. A pedicab is a similar idea. Other advantages of a microcar have to do with comfort and ease of use. Bicycling manufacturers are used to asking the bicyclist to conform to the bike. Our microcar must instead incorporate some of the same human-centered design that makes Apple products such big hits. Bicycle manufacturers haven’t yet begun to explore the design opportunities that come from having an electric motor and a big honking battery on a bike. An obvious opportunity is to power the bike lights from the central battery rather than have separate batteries and switches for each light. Now that we have a canopy we can begin to think about how to keep passengers warm. Another set of design opportunities comes from the cyclist no longer having to be thrifty with power. For example I took the toe clips off of my Xtracycle since any minor advantage they offer is overwhelmed by what the motor can do. And it now becomes possible to consider a shaft drive instead of a chain drive, since its minor inefficiency pales in comparison with the advantage of not having a greasy chain. Here are some general microcar design criteria with some ideas about how they might be satisfied. Got ideas of your own? Please comment and I’ll add them to this post. My microcar can carry the driver and one passenger comfortably. The biggest design choice here seems to be having people sit side-by-side or front-back. I like front-back so that the vehicle is narrow. This is important so that the vehicle can ride on the shoulder since it is slow. But a side-to-side design, particularly a recumbent trike, could be explored. My microcar protects the occupants from rain, wind and cold. The traditional microcar uses sheet metal or plastic. I think cloth is the best material since it is lightweight. A cloth cover can be changed to fit the season. The winter cover could be insulated. And it may be possible to integrate electronics into the cloth, such as tail lights and headlights. My microcar is easy to maintain. My microcar weighs between 100 and 1000 pounds. My microcar is powered by a 500 to 1,000 watt motor. Now that New York will have a 1,000-watt maximum motor size, I am imagining an Xtra-cycle microcar that has a tricycle attachment replacing its rear wheels. And each wheel of this trike attachment has a 500-watt electric motor hub. Now we’re talking. My microcar has a top speed of 20mph. My microcar costs less than $5000. My microcar has a 400 pound total cargo and occupant capacity. 1912 Morgan Runabout Deluxe Cyclecar. 1940’s two seat open top Fantom bicycle car. Post WWII Messerschmitt Kabinenroller microcar. A NEV made by Global Electric Motorcars, a company originally created by a team of ex-General Motors engineers.